If kombucha is good for the gut, imagine its nutritional value boosted with weed. 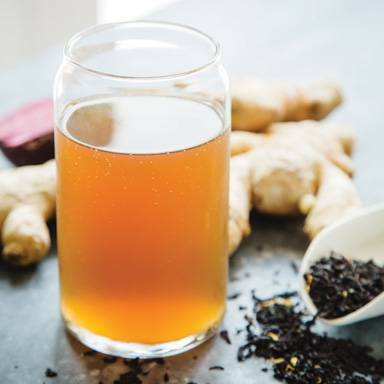 The fermented tea has been gaining ground for the past several years, showing growth in the beverage category that’s otherwise flat. According to nonprofit Kombucha Brewers International, sales have grown 30 to 50 percent year after year and are expected to reach $2 billion in sales by 2020. Kombucha makes up a small sliver of beverage offerings, but it’s probiotic profile has made it an ideal partner for weed, a pairing that has immense appeal to health-conscious consumers. Daniel Grim’s San Diego company, Good Stuff Tonics, started bottling “cannabucha” about two years ago as a part of his weed beverage business based in San Diego. Flavors include ginger apple, hibiscus ginger and blackberry. Noah Hebby sells oak-aged kombucha on tap at several dozen locations in Florida under the name Awaken Kombucha. His line includes a brew infused with CBD. Marijuana is still illegal in Florida, but Hebby uses its sister strain hemp, rich in anti-inflammatory and pain-relieving CBD, but below 0.30 levels of THC. Both Hebby and Grim say their respective cannabis infusions don’t overpower the flavor of their brews. “Two out of three people don’t taste it, and one out of three says it adds a nice floral note,” says Grim. There’s some mystery regarding kombucha’s beginnings, but it’s generally believed to have originated in Asia as many as two millennia ago. It’s made from sugar, black or green tea and an active starter culture called a SCOBY or symbiotic colony of bacteria and yeast. Hebby suggests DIY kombucha brewers obtain their first SCOBY from a reputable company, like Kombucha Kamp—which sells kombucha starter kits online. It’s important to use black or green teas that aren’t oil-based, he says—an oil-based tea can negatively affect fermentation. Home tea brewers can also grow their own SCOBY using a bottle of their favorite store-bought unflavored kombucha. Just pour it into a canning jar, cover it with a piece of breathable cloth, and leave it in a dark place. In about two weeks, you’ll have a round, mucus-like SCOBY. Make sure not to drink the sour tea that’s left over (it won’t taste good). The simplest way to make infused kombucha, they say, is to pair an alcohol extraction process with a DIY kombucha brew: extract the THC from flower while you’re brewing kombucha, and then experiment by dosing the final product with dropperfuls of cannabis tincture. That way, says Hebby, you can also control the effect of the cannabis without overpowering the flavor profile of the kombucha. More adventurous home-brewers can use their marijuana tincture to create infused cannabis sugar, and then use that in a kombucha recipe. Flavor is added during second fermentation. Grim and Hebby suggest using a juicer to add fruit flavors and a mortar and pestle to grind up spices like coriander and clove. Add juice and spices to the brew and let it continue to carbonate and ferment for three to seven more days. The longer it ferments, the fizzier it gets. Hebby also suggests keeping a cup of unflavored starter culture to jump-start the next batch. Use caution when it comes to dosing. Everyone has a different tolerance, and it’s important to learn how your body reacts to different amounts of cannabis.